WASHINGTON (dpa-AFX) - Pentair plc (PNR) announced a profit for first quarter that declined from last year. The company's bottom line came in at $51.3 million, or $0.30 per share. This compares with $102.9 million, or $0.57 per share, in last year's first quarter. Excluding items, Pentair plc reported adjusted earnings of $74.0 million or $0.43 per share for the period. The company's revenue for the quarter fell 6.0% to $688.9 million from $732.6 million last year. 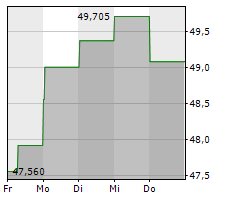 -Earnings (Q1): $74.0 Mln. vs. $88.9 Mln. last year. -EPS (Q1): $0.43 vs. $0.49 last year. -Analysts Estimate: $0.45 -Revenue (Q1): $688.9 Mln vs. $732.6 Mln last year. So Were Hedge Funds Right About Piling Into Pentair plc (PNR)?